Writer Abroad loves printed books so she just didn't know if she could bring herself to do the unthinkable: Read an e-book. Nevertheless, Writer Abroad got a Kindle in December. But like any good traditional book lover, she procrastinated. She didn’t read her first e-book until May. Call it desperation because she was not only traveling, but also sleeping in the same room as Baby M. And a book she could read in the dark? Perfect. The day she was leaving for her trip, a friend recommended Let’s Get Digital by David Gaughran: How to Self-Publish and Why You Should. It was a self-published e-book and it cost less than $4. Writer Abroad didn’t even read the blurb. She bought it and read it in two days. It was wonderful. It was wonderful to read on the Kindle as she could hold the Kindle with one hand and Baby M with the other. It was wonderful because this book wasn’t even available as a print book so she couldn’t have read it any other way. And it was wonderful because the book itself was inspiring. 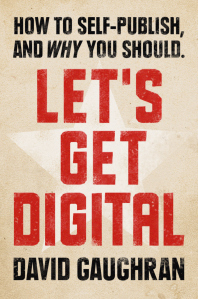 Let’s Get Digital was well written, informative, and made Writer Abroad believe self-publishing and e-books just might be the best things to ever happen to writers. The book gave an overview of the troubled traditional publishing industry and how the internet has revolutionized publishing to make it easier than ever for writers to find audiences and make money from writing. It also discussed how to self-publish: how to find editors, create book covers, format, and more. Finally, 33 bestselling self-publishers shared their inspiring stories. They made Writer Abroad wonder, what the heck is she waiting for? As a reader, writer, and international traveler, Writer Abroad has decided an e-reader may just be of the best inventions this century. What do you think about e-books as a writer and/or reader? I was the EXACT same way before getting my e-reader. Then I had a baby and spent hours rocking her, nursing her, and reading with one hand! I counted how many books I've read on that thing in the last 2.5 years. Ready for this? 125. I can't wait to read that book recommended, too! Excited to hear about your self-pub journey. If you need some resources, I have some if you're interested! 125. Wow! What a number. I'm already at three in less than a month so I guess I'm on track. Always open to hearing about resources, thanks! Quite it's always heading to increase all those can help provide just about anything big additionally prefer still higher by means of near future. At that time just click right Check Cashing Spring-Valley Enjoy it suitable gratifying imparting.